OK, it’s over now. The liberal, Keynesian economic models have now exhausted their usefulness and their failure is so obvious, that its supporters are now reduced to science fiction in order make their theories fit. 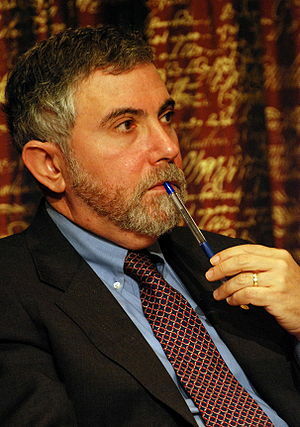 Enter Paul Krugman, noted New York Times columnist and Nobel Prize winning Professor of Economics. “Think about World War II, right? That was actually negative social product spending, and yet it brought us out. I mean, probably because you want to put these things together, if we say, “Look, we could use some inflation.” Ken and I are both saying that, which is, of course, anathema to a lot of people in Washington but is, in fact, what the basic logic says. It’s very hard to get inflation in a depressed economy. But if you had a program of government spending plus an expansionary policy by the Fed, you could get that. So, if you think about using all of these things together, you could accomplish, you know, a great deal. I anxiously await the bumper stickers for 2012 with this economic platform. True enough, but as George Will pointed out on This Week besides the actual $800 billion plus stimulus, we’ve also had 5 trillion dollars in deficit spending since President Obama took office, the very backbone of Keynesian stimulus. That dwarfs Krugman’s mere doubling of the original stimulus bill. If five trillion is not reviving a moribund economy, I don’t know that any amount of stimulus will. In addition, Krugman has had to defend the record of Keynesian stimulus bringing about economic recovery. When has it ever worked? On previous shows, the only example of successful Keynesian stimulus he has been able to come up with is World War II. But World War II was a lot different from the type of stimulus that Krugman and others have recommended. Although there was full employment due to the government demands for war goods, the wages were low; particularly for the 15 million Americans in uniform during the war. We were under wage and price controls, few consumer products were being made or were available, and most staples were rationed. With little to spend their money on, savings rates shot up during the war years; either through bank savings or war bonds. That doesn’t seem much like a stimulus to me. And I doubt the President would have had much luck pushing this through even a Democratic Congress. So if you follow the liberal logic train that really leaves us only one choice; to be invaded by aliens. Now of the various types of invasion scenarios, which one should we choose? The Falling Skies scenario appears to have been a real downer for the US economy. In the TNT network show, 98% of the World population is dead, and the only available jobs for humans appear to be soldiers and direct soldier support. However there is no surviving industry or good union jobs. It looks like all the jobs went to the alien’s home planet. The Stargate franchise had the United States engage in not one, but several wars against various alien bad guys, and at least one extra solar human enemy. However all of these wars were covert affairs whose costs were hidden in the Defense Department’s black budget. No stimulative effect to the US economy was noted in any of the episodes, however the US did benefit from technological progress gained by reverse engineering alien technology. But as all of these developments were classified, there was no larger economic benefit to the US economy. I think what Krugman really had in mind was some sort of Independence Day scenario. In that 1996 movie, aliens in gigantic spaceships come to earth and just start blasting away at the world’s cities. Although the aliens are eventually defeated, the planet is devastated, but not so devastated that there still isn’t a functioning government or industry. Opportunity to rebuild? Golden! With giant holes in every large US city, there is ample opportunity for shovel ready jobs to work on rebuilding a broken infrastructure. The President has promised a secret economic plan that he will reveal in September. Given that the government has exhausted all of its usual gimmicks from both fiscal and monetary policy. That pretty much leaves the aliens. Let’s hope he doesn’t just copy/paste the President’s speech from Independence Day.